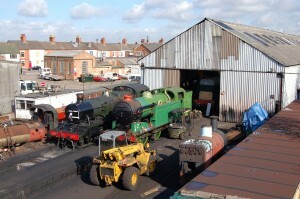 The Locomotive Shed at Loughborough Central is situated north of the station and just north of the Empress Road Bridge. It is accessed via a path off the north end of the platform past the signalbox and under the bridge. Supervised access is available on most running days. 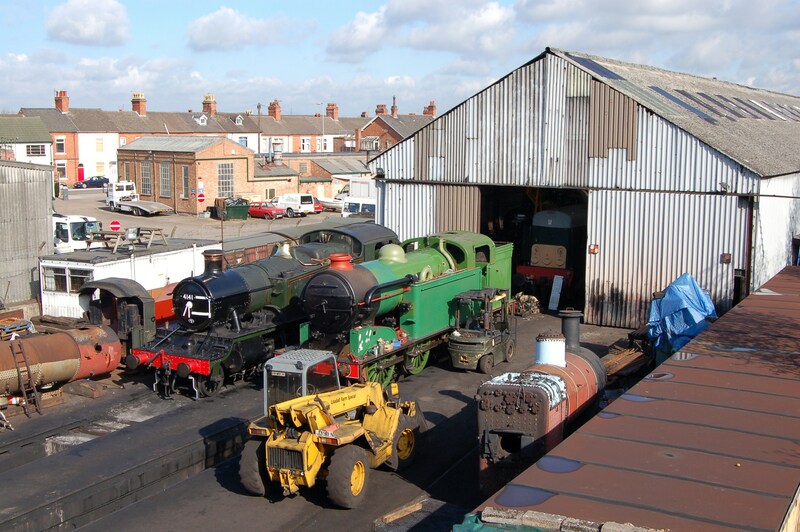 The shed is the base for all the restoration, repair, maintenance and preparation for running of all the locomotives, both steam and diesel, on the railway. 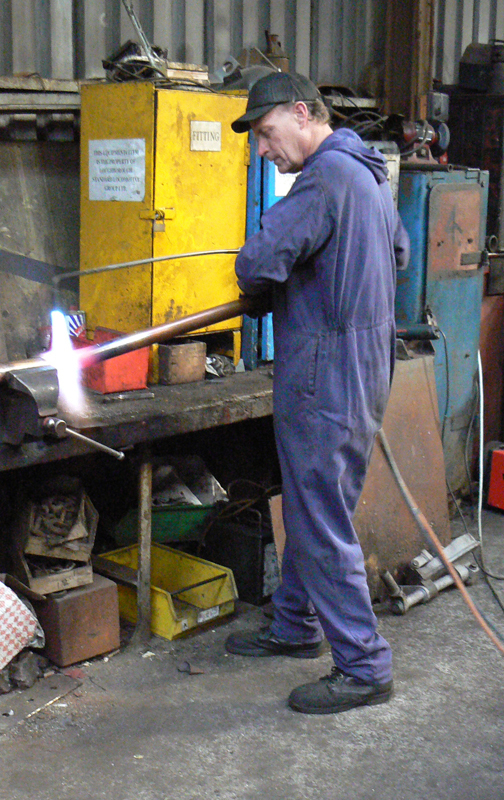 All manner of work is carried out there including the manufacture of boiler stays, nuts, bolts and linkages, the white metalling and making of bearings, the tubing of steam locomotive boilers to the complete stripping down and re-building of complete locomotives and diesel engines. Many locomotives have been restored from scrap yard condition to a standard that fits them for running on the National Network. The shed has t hree roads, two equipped with pits for inspection and work underneath the locomotives and has lifting jacks to allow locomotive frames to be lifted enabling wheels to be removed and replaced. At the north end of the shed is a comprehensive machine shop and there is considerable welding equipment ready for use. Outside the shed further pits are provided to allow for the disposal of locomotives after the working day and for the removal of ash from steam locomotive ash pans. The coal store is outside the shed and staff rooms are provided for all grades of locomotive staff. Concrete pads are provided for boilers under repair and for the base for cranes when undertaking heavy lifts such as when removing and replacing steam locomotive boilers. With locomotives weighing up to 140 tonnes in full working order the shed area is one where care must be taken in moving around. 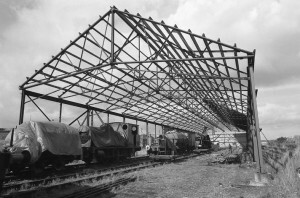 Construction of the shed started in 1973 when it was placed over the former two running lines of the Great Central Railway. Space was made for a line to run round the west side of the shed and on to and over the Grand Union Canal Bridge north of the Locomotive Shed. Over the intervening years many facilities have been added to the shed on an almost continuous basis. Pits, concrete walkways and machine tools have been added and in 2011/12 a new whitemetalling facility has been installed. The work carried out in the shed is of the highest standard and several restored locomotives have been restored to main line standard. 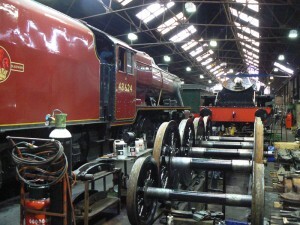 In 2012 three locomotives based at the shed, Nos.5305, 30777 and 70013 are regularly operating on the main line and return to Loughborough for regular maintenance. As further proof of the quality of the work the National Railway Museum at York has entrusted the staff at Loughborough with the restoration of many of their locomotives. Nos.30777. 63601 and 70013 are amongst their number. As the reputation of the shed has spread the Locomotive Shed is the base for much contract repair work for other railways. A long held ambition of the railway has been to reunify the lines north and south of the Midland Main Line which runs approximately East to West north of the Shed. In the early 1980s the original Great Central Railway bridge over the Midland line was removed to make way for electrication, something that has yet to happen, and the embankment between the Grand Union Canal and the Midland line, removed. While the position of the shed was planned to make way for thi s development the current thinking is that the position of the shed does not allow for that reunification to be done in the best way. Thus the shed will have to be moved. The site of the re-location has yet to be determined.